Turkish President Recep Tayyip Erdogan hit back Sunday at his U.S. counterpart Donald Trump threats of "large sanctions" on the country. 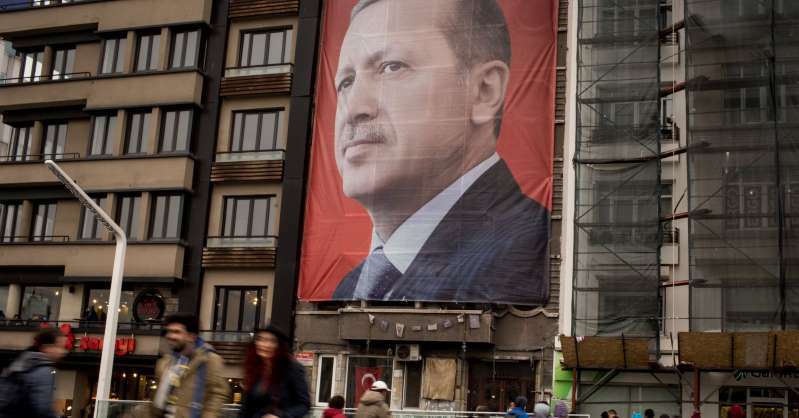 But Erdogan may have to restrain himself, as the last thing Turkey's already-troubled economy needs is another blow. "You can't make Turkey step back with sanctions," Erdogan was quoted as telling reporters during a visit to South Africa. "If the U.S. does not change its stance, it should not forget that it will lose a strong and sincere partner." 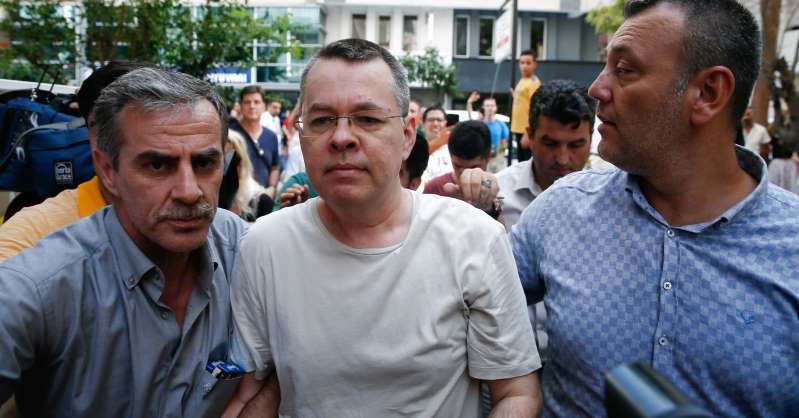 Trump floated the potential sanctions Thursday over Turkey's ongoing detention of American evangelical pastor Andrew Brunson, who was arrested in 2016 on charges of being involved in the failed military coup to oust Erdogan. Brunson has consistently denied the charges. [post_ads]While he didn't offer details of what any sanctions might entail, Trump's threat alone was a source of concern for both investors and the Turkish government, which have been witnessing the downward spiral of an increasingly battered economy. Last week, the Turkish lira plunged around 4 percent after the country's central bank failed to raise interest rates despite soaring inflation. The decision deepened market fears that the bank was not independent from Erdogan, who has railed against rate raises in favor of faster economic growth. This amid a widening current account deficit and inflation at more than 15 percent means Erdogan cannot afford a blow like U.S. sanctions. While the president — recently re-elected to a far more powerful executive presidency — sounded bellicose in his response, his wisest course of action is to avoid escalation, analysts say. "I think the Turks will eventually back down... the Turks ultimately know their Achilles' heel is the economy," said Timothy Ash, senior emerging markets sovereign strategist at Bluebay Asset Management. "Anyone who knows Erdogan, knows that his response was quite restrained. He waited three days to comment, and the language used was relatively diplomatic." Interestingly, Secretary of State Mike Pompeo was not initially aware of Trump's comments, which were also echoed by Vice President Mike Pence. Diplomats on both sides are likely working on a solution in order to save face and avoid escalating tensions in what has already become a fraught relationship between the NATO allies. Washington and Ankara have been at odds over the latter's relationship with Moscow and its purchase of Russian weapons systems alongside a deal to buy American F-35 jets, as well as its human rights record and its policies regarding Syria and Iran. "Pompeo will need to handle Turkey, and Erdogan carefully herein," Ash said. "Erdogan needs to be given a ramp down, (an) exit strategy." Curiously, Turkish markets were not particularly roiled by the sanctions threats — perhaps it would take a more concrete announcement, or perhaps markets are becoming accustomed to the American president's frequent bluster. Structural positives for Turkey, including its public finance position, high growth rate, strong banks, and good demographics, have provided a significant help in this regard. Prior to the announcement, Brunson was moved from jail to house arrest, and Turkish officials have reportedly been discussing his release. Near-term positives like the Brunson move, as well as Germany lifting restrictions on European Investment Bank lending to Turkey, and the Dutch reopening consular access in the country, are also "evidence of easing pressures with the West," Ash said. The Trump administration could also go-ahead with sanctions, but in a more "benign" manner, the strategist added, like restricting lending from international finance institutions — which would send a message without hammering the economy. But if Washington doubles down and Turkey does not let up on Brunson, what has become a diplomatic flashpoint could very well contribute to a much deeper economic crisis.